As you can well imagine Divan Beds are one of the most popular choices with consumers in the UK. The instantly recognisable divan designs offer familiarity, practicality and a huge range of choice. All our Divan Beds are delivered Free to the UK Mainland. Our stunning range starts at just £150 for the Canvey Divan which has our exclusive Sleepzone Spring for a sounder night’s sleep and a traditional tufted mattress with storage options through pull-out draws in the base. An absolute bargain, and definitely one of our most popular divan beds. You get a Free Bedding Pack worth £174 on orders over £500. Or there's the Pocket 800 that starts at just £159 and, as the name suggests, has 800 individual pocket springs in a lovely design that offers complete luxury at a very affordable price. In the mid-range, the Luxury Latex Divan offers long-lasting luxury with ultra-premium latex foam layers, (100mm layers), it has a superior cell structure that's hypo-allergenic and dust mite resistant meaning it will never need turning and will last for years. At the top of our range you've got the Chill Pocket 1500. The mattress on this divan set contains a massive 1500 quality pocket springs in a 3D mattress border with a CoolGel ultra air system filling complete with memory foam for the ultimate night’s sleep. For further information on our range of Divan Beds please call our Sales Team on the Freephone number provided. Divan Beds There are 31 products. An attractive starter bed with 13.5g open coil spring. The mattress is 7-8 inches deep and covered in damask fabric. Designed for the little ones, this bed is available in a blue football or pink hearts damask fabric. Ideal for all children, the Kiddi mattress features a 13.5G spring unit which is surrounded in fine fillings and completed with a bonded fibre cover. The Reo is a perfect budget bed that'll suit any age. This bed is very popular amongst Landlords as they know their tenants are sleeping well on a very comfortable mattress. The Reo mattress features a 13.5G spring unit which is encased in a combination of fine fillings and bonded fibres. The Crystal is a luxurious open coil mattress which features multiple layers of Classic Fillings. These fillings are guaranteed to offer you a supportive and comfortable night's sleep. This bed is mattress is covered in a damask fabric which offers a soft feel to the touch. The Memory open coil mattress features a 13.5G spring unit which is surrounded by layers of memory foam and bonded fibres. This mattress is completed with a soft touch fabric cover. The Super Damask mattress features a 12.5G orthopaedic spring unit surrounded by layers of firm fillings. These fillings offer a firm tension which supports your back throughout the night. The Galaxy mattress features a 12.5G orthopaedic spring unit with generous layers of luxurious fillings. This mattress provides a firm yet comfortable sleeping surface. The bed is finished with a high-quality damask cover. The Jasmin bed features a firm tension mattress that contains orthopaedic springs. These springs are encased with generous layers of supportive fillings. This mattress is finished with a white damask cover which offers a soft touch feel. The Tufted Ortho mattress is one of Tendersleep's best sellers! It contains a 12.5G orthopaedic spring unit with multiple layers of supportive fillings. This mattress is ideal for those who prefer a firmer feeling sleeping surface. The Knightsbridge has been designed for those who specifically require a firm mattress. It features generous layers of firm fillings that have been tufted together, these fillings encase a 12.5G orthopaedic spring unit. 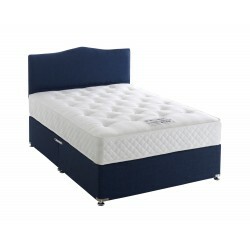 The Premium Gold bed offers a fantastic firm, yet comfortable sleeping surface. This mattress has a very unique black border which holds in the 12.5G orthopaedic spring system and other fillings. The black border is used as it includes vents which allow airflow, this helps maintain a cool sleeping temperature.